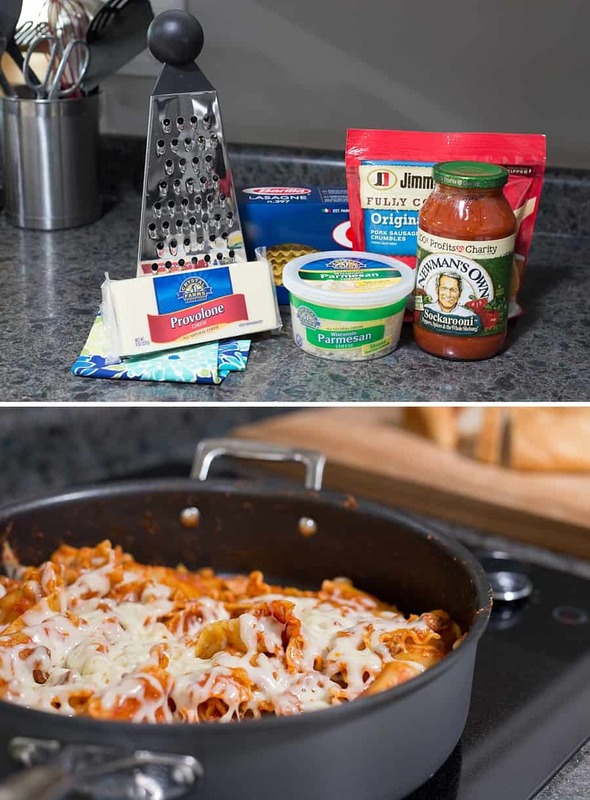 Skip the oven… This easy-cheesy, One-Pot Stovetop Lasagna is a delicious twist on a family-friendly classic. Big thanks to Crystal Farms® for sponsoring today’s recipe AND for offering a chance to win a Cuisinart® GreenGourmet™ Square Grill Pan below! Last fall, I fell in love with a vintage ’50s ranch-style home on the other side of town. The only downfall about moving there was that it didn’t have air conditioning. We decided to go for it, and our family made the big move last September! We’ve been using hot days with no central air as an excuse for our family to go to the pool, see a movie, or visit friends (who DO have A/C!). Still, we’ve started to miss some of our classic oven-baked standbys — in particular, lasagna. What’s a family do to? Well, this summer I’ve experimented and created a new family favorite — One-Pot STOVETOP Lasagna. There’s no need to turn on a HOT oven for this easy-cheesy, family-friendly recipe. What else do I love about this recipe? Mix and match these ingredients for a new dish each time you make it! Of course, what makes this recipe insanely delicious is the CHEESE. Crystal Farms® is nestled in the heart of America’s Dairyland, calling Lake Mills, Wisconsin, home for the past 25 years. Today, the Crystal Farms® brand is one of the largest cheese brands in the country, but the hard-working people of this small city (population only 5,708) are devoted to delivering consistent quality and great-tasting products for what they love—CHEESE. Crystal Farms® cheese products are natural with few preservatives, a rich source of calcium, gluten-free, and lactose tolerant. Small town roots. Big time quality. 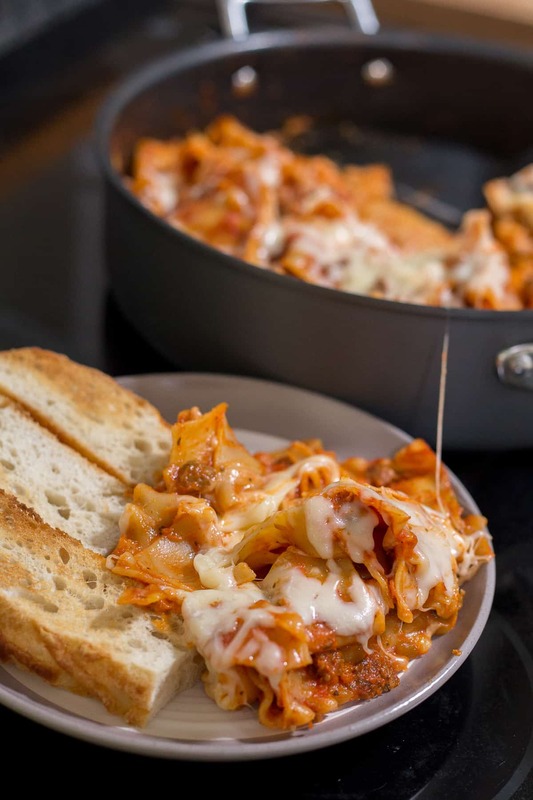 Doesn’t this easy One-Pot Stovetop Lasagna recipe sound amazing?!? 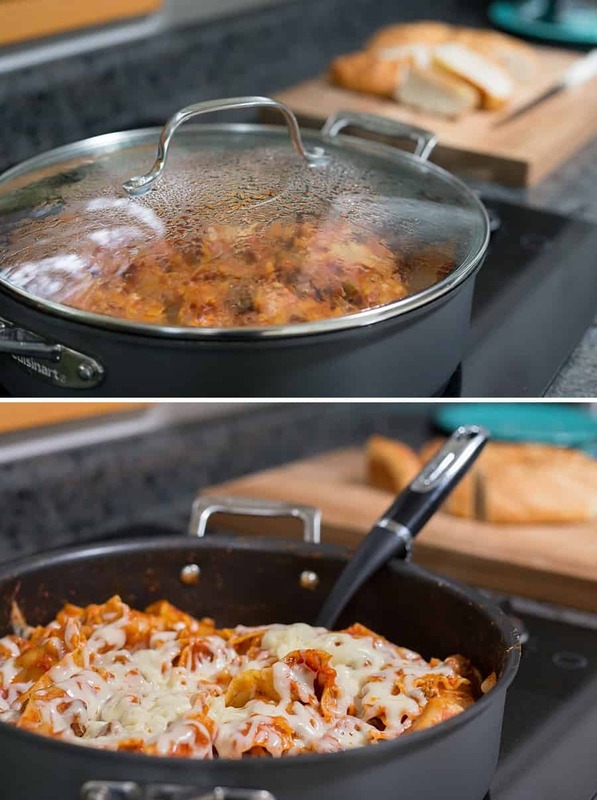 Begin by turning the stovetop burner on high and combining your pre-cooked meat, half the container of spaghetti sauce, and 1 ¼ cups of water into the skillet. Wait for the mixture to boil, then turn the stovetop down to low. Break half of the lasagna noodles into fourths and layer over the sauce mixture. Pour the remaining spaghetti sauce on top of the noodles. Then cover with the rest of the broken noodle pieces. Add ¼ cup of water to the spaghetti jar, and give it a good shake. 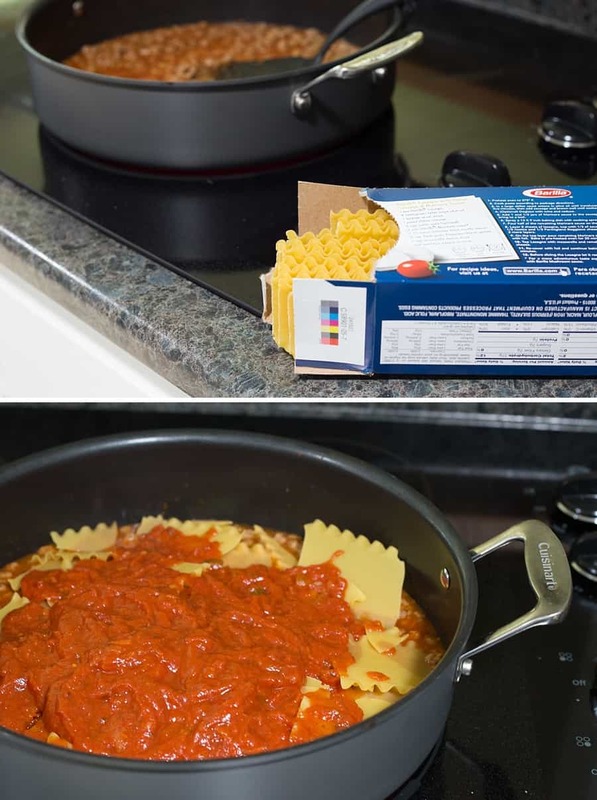 Your grandma would be proud; you’re not wasting any of that delicious sauce! Pour it in the skillet, give it all a solid stir, and pop the lid on the pan. Again, it’s vital that you put the pot top on the skillet. The lid traps the moisture, which cooks the noodles. 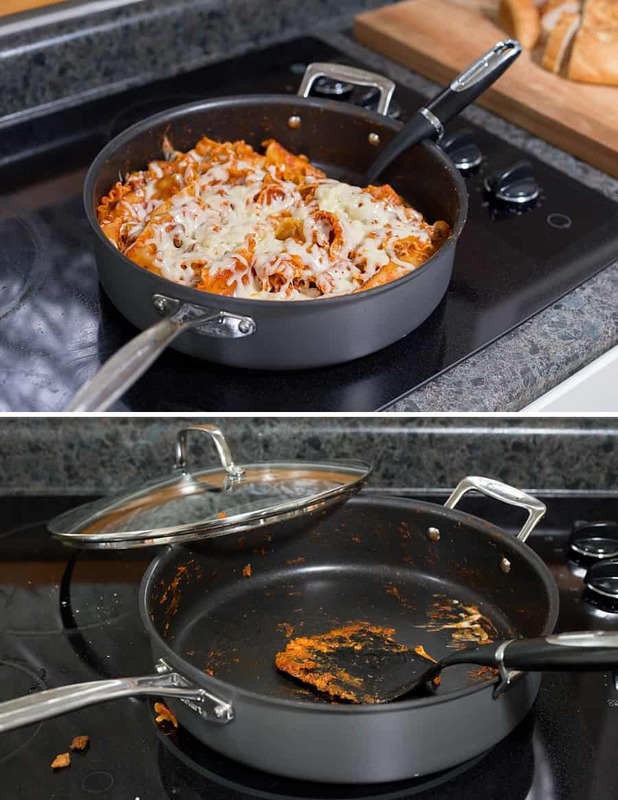 No lid, no lasagna. The skillet needs to be stirred twice during the process, approximately every 7 minutes or so (set your stove or smartphone timer) to ensure the noodles don’t stick to one another. A gentle reminder, a cheese shredder is a sharp kitchen tool, so I highly recommend caution and adult supervision. Of course, you know your child’s hand coordination skills better than anyone. Be smart. Be safe. Here’s the printable copy of the recipe I promised! 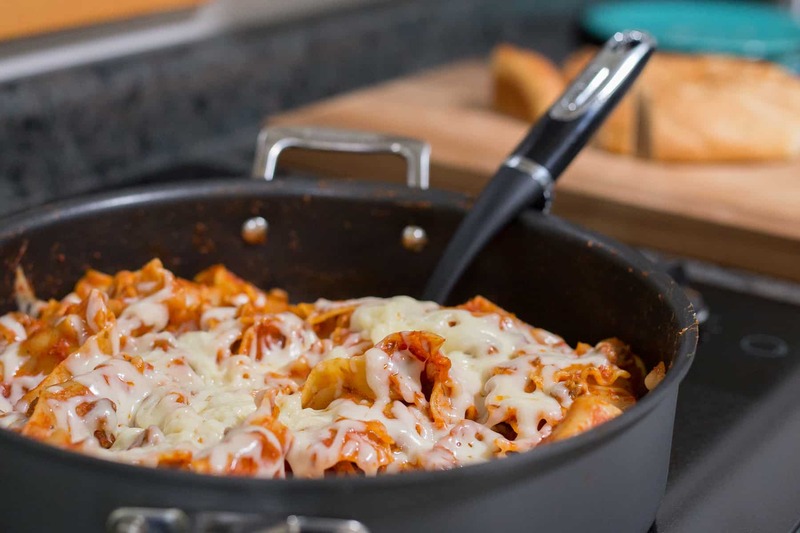 You'll have a delicious family dinner on the table in 20 minutes with this easy-cheesy, One-Pot Stovetop Lasagna. In a 5-quart cooking pot, mix half the spaghetti sauce, 1¼ C water, and any pre-cooked meat or fresh vegetables. Top with a layer of noodles. Cover noodles with leftover sauce and cover with remaining noodles. 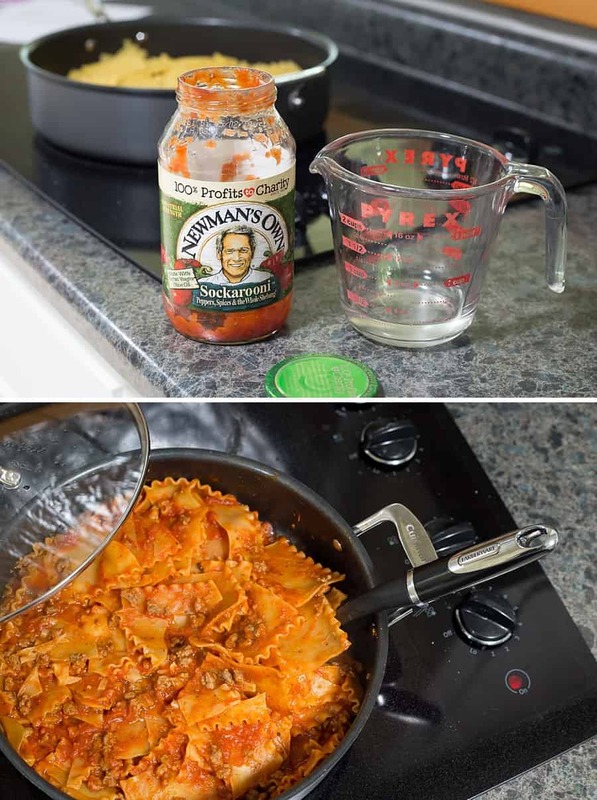 Add ¼ C water to spaghetti sauce jar, then shake and pour into skillet. Stir gently. Bring mixture to a boil, then reduce the temp to low and cook for 20 minutes with the lid on. When noodles are al dente, remove the pot from the burner. Gently stir in half of the shredded Crystal Farms® Provolone Cheese and half of the Crystal Farms® Shaved Parmesan Cheese. 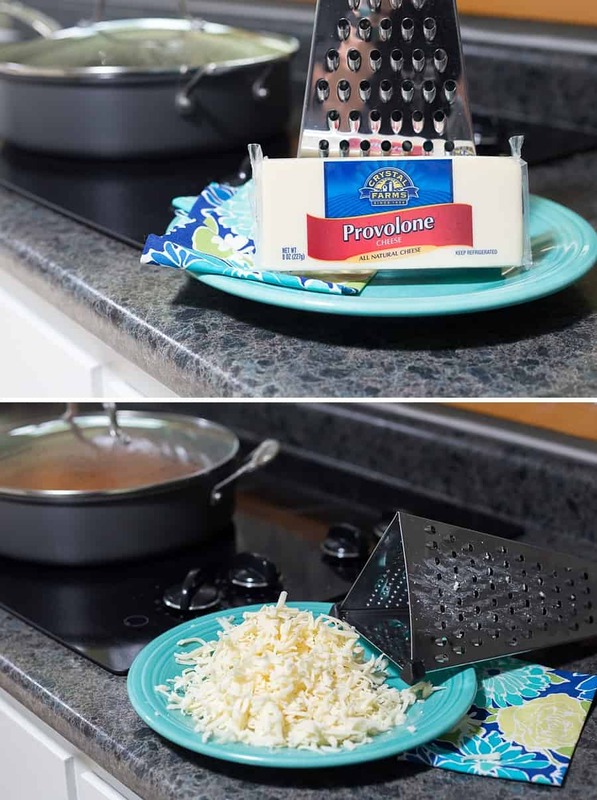 Top with remaining Provolone, then cover and let sit for 5 minutes to allow the cheese to melt. You can add a variety of additional ingredients including (but not limited to) fresh spinach, peppers, onions, Italian sausage, hamburger, Crystal Farms® Ricotta, as well as other varieties of cheeses. The entire delicious dish was gone in a flash! You’ll want this no-oven, One-Pot Stovetop Lasagna on the menu this week FOR SURE. Your family is going to LOVE this easy-cheesy, summertime lasagna. If you have any questions about the process, reach out to me in the comments. And if you have any other recipes or tips for families trying to “beat the heat” in an A/C-free home, let me know… The hottest days are yet to come here in Wisconsin! P.S. To get you experimenting with stovetop meals, Crystal Farms® is giving away a Cuisinart® GreenGourmet™ Square Grill Pan (value of $49.95) to one lucky reader. How cool is that? Enter below for a chance to win. never understand. It kind of feels too complex and extremely extensive for me. I am having a look forward on your next put up, I’ll try to get the hold of it! Sounds good! Next summer try a Crock-Pot in the garage or porch. (That’s what I did when pregnancy made food smells something I couldn’t tolerate.) Make sure it’s on a stable heat proof surface and pet proof. You don’t want to come home from work to find out Fido ate your dinner for you.